On the coattails of Edge’s 5-year anniversary, Edge officially retired as a 25-Man Raiding Guild. Edge slew Heroic Ultraxion, and capstoned an amazing run with 3 years of being top 100 US and 2 years of being in the Top 50 US. I would be remiss not to personally thank all those in Edge, past and present, for an amazing place to call home on Garona. The officers have done an amazing job, and welcomed me into their midst as an unknown Priest and made my way to officer myself a few of months ago. 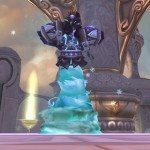 Meloree, our Main Tank, Raid Leader, and really backbone of the guild should be commended on his stalwart loyalty and drive to push the guild to do what he knew we could. Mel is more than just a great RL, he also is a great friend. Thank you, sir… you should be proud of what you’ve helped Edge do. While I am sad to see <Edge> retire after an amazing 5 years of raiding, I am glad that I was lucky to make some great friends there… thank goodness for Real ID! This post does more than memorialize Edge, it also highlights a new chapter in my raiding life. As of Wednesday, I am officially an Applicant with Something Wicked on the US-Whisperwind server. I am excited at this new opprtunity, the folks there so far seem like a great group. I am really excited to get the chance to raid with some existing friends I’ve met through the WoW Blogging/Twitter Community as well as a former guildmate from my first-ever Raiding Guild. My first raid was last night, and things seem to be off to a good start. I’m learning how the other healers heal, how the tanks take damage, and how the guild formulates strats. We made quick work of Heroic Ultraxion and fast repeat kill of Heroic Blackhorn… and now onto Heroic Spine. I welcome the challenges of working with a new team during my trial, figuring out how to gel in the healing core as a unit, and hopefully move onto Pandaria as a strong healing core.